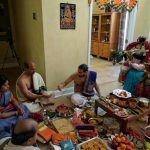 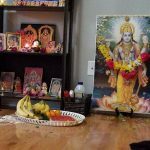 Orlando GOD Satsang members were blessed to celebrate the first official GOD satsang at the Hindu temple at Casselberry in front of Lord Krishna and Radha Rani on February 17th 2017, where 25 devotees participated in the satsang. 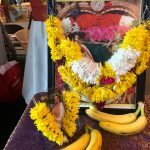 Rendition of Nama sankirtan, Madhuragitams, Namavalli and ending with Kaliyayum Bali Kollum was one of the greatest blessings we experienced. 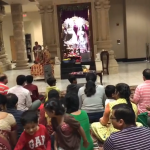 Satsang members offered their prayers to Sri Swamiji and hakurji that the temple satsang and GOD family grows by leaps and bounds, and everyone attending the satsang should be filled with more and more Bhakti towards Thakurji’s Holy Feet.